After you've submitted your request, you'll begin receiving quotes from vendors interested in your event. These quotes will include cost, service details, a cancellation policy and any additional terms the vendor chooses to include. When you receive a new quote, you'll be notified via email (and text if you've opted to receive them). From that notification, there will be a link to follow to see the quote and respond. You can also see your quotes at any time by logging into your event planner account and going to your Inbox. Any unread items in your Inbox will be in bold with a red dot beside the vendor's name. If the unread item is a new quote, it'll show the total price quoted. If an unread item just says "Waiting on quote" with no price, that means the vendor has sent you a message. Click to open the thread and see the message or quote details and respond. Or, if you're on iOS, you can download the GigSalad app. The app gives you a convenient way to manage your request and respond to vendors. You'll also get push notifications when you get new quotes and messages, making communication quick and easy! Price: Obviously the price will be one of the most important factors in determining whether or not to book a vendor. The price shown is the total cost for the vendor, including the deposit, balance payment, and sales tax (if applicable), plus GigSalad's service fee. You will pay this total cost upfront in order to secure the booking. The deposit will be released to the vendor prior to the event, but the balance will be held until the day after the event. Read more about making payments. Expiration date: The top of each quote will tell you how long you have to respond. Vendors set an expiration date because they can't hold a date/time indefinitely. If they don't receive a response quickly, they may accept a different gig instead. So make a decision and respond as soon as possible! Services to be provided: This is where the vendor will include a message explaining the services they are offering to provide for your event. If you feel anything is missing or unclear in this section, you can send a message to the vendor to discuss prior to booking. Cancellation policy: The vendor will set a specific cancellation policy for your event that will determine what happens to the deposit and balance payment if you cancel. This section may also include additional terms if the vendor chooses to add some. When you accept a quote and submit payment, you are agreeing to these terms so be sure to read them thoroughly. Read through everything carefully and then determine how you'd like to respond. Once booked, all these details will be part of your "booking agreement" so it's important that everything is accurate. At any point in the booking process, you can easily access the vendor's profile and media samples through the Vendor Info card that appears alongside your messages & quotes from that vendor. On mobile, this card will be located underneath your communication thread, and on a desktop browser, it'll be on the right. Looking at a vendor's full profile can help you make an informed decision when choosing who to book for your event! There are three actions you can take when you receive a price quote. If you're happy with the quoted price and all the details & terms look good, then you are ready to book. Just click the Book Now button and proceed with payment. Remember, when you book on GigSalad, you'll be protected by our Worry-Free Guarantee. If you don't agree with the price or terms, or the vendor just isn't quite what you were looking for, you should decline the quote by clicking the Decline button. When you do this, you'll be able to include a message to the vendor to explain why you're declining. This can be helpful because perhaps your reasons are rectifiable and they could propose a new quote/terms you are happy with. If you're not ready to book or decline the quote, you can instead message the vendor to ask questions or discuss any of the booking details. To do this, scroll back to the top of the thread and type your message in the provided text box. 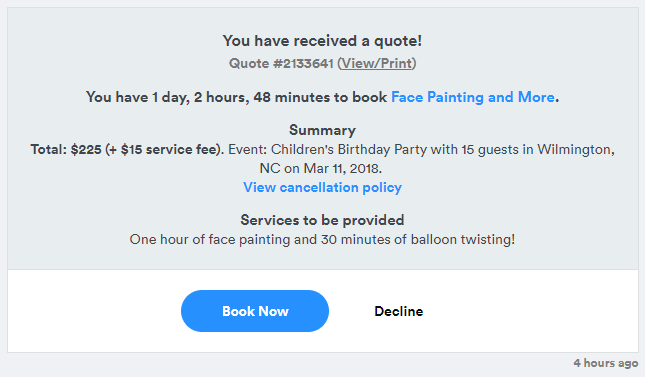 If you update your event details, any existing price quotes you've received for that event will be automatically canceled. These will be displayed as "outdated" and you'll no longer be able to accept that specific quote to book the vendor. 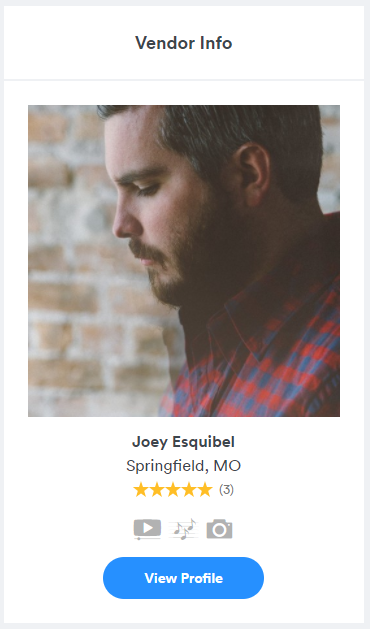 We do this because many detail changes can affect both pricing and availability for the vendor, so they need to have the chance to adjust their quote accordingly. If the vendor does not send you a new price quote, you should message them to ask for one. Each quote will have an expiration date that is set by the vendor when they build the quote. They set an expiration so that they do not have to leave your event date open on their calendar indefinitely. However, if the quote expires, it does not mean you cannot book them. If you are still interested, you should send the vendor a message to ask if they are still available. If they are, they will need to send you a new price quote so you can proceed with the booking. I haven't heard anything back from my request. What do I do? If it's been a day or two since you've submitted your request and you haven't heard back from any vendors (or a specific vendor you were particularly interested in), we recommend following up with a message. To send a message, log in to your event planner account and select the appropriate event from your Recent Events. Click on the vendor you want to follow up with, type a message in the box provided and hit Send. If you still don't hear anything back, can either search for another vendor or contact us for help! Why am I getting so many responses? If you are receiving calls or messages from people you didn't specifically choose, it's likely that you selected the option on the request form that asked if you'd like additional quotes from other professionals. If there are some vendors that are contacting you that you are not interested in or no longer wish to communicate with, you can block communication so they aren’t able to send you any further messages or quotes. What do I do if the vendor asks me to contact and/or book them directly, rather than on GigSalad? Because of the guarantee and protections we offer, we encourage you to keep all communication and bookings on GigSalad. Here's why! But if talking to a vendor directly helps you make an informed booking decision, feel free to give them a call. If a vendor asks you to book them outside of GigSalad, we recommend directing them back to our platform so we can provide the same benefits to you as our other event planners. Any bookings outside of our booking platform are not eligible for dispute resolution, secure payments, or GigSalad booking protection. If you receive a suspicious, questionable, or fraudulent message, please let us know right away by flagging the message.